Washington placed five players on the All-Pac-12 first team and Washington State contributed two. Six Huskies and three Cougars made the second team. Washington placed five players on the All-Pac-12 first team announced Tuesday while Washington State contributed two. Neither UW’s Jake Browning, last year’s Offensive Player of the Year, nor WSU’s Luke Falk, who established every significant conference passing record this season, made the first or second teams. Both were honorable mention selections. 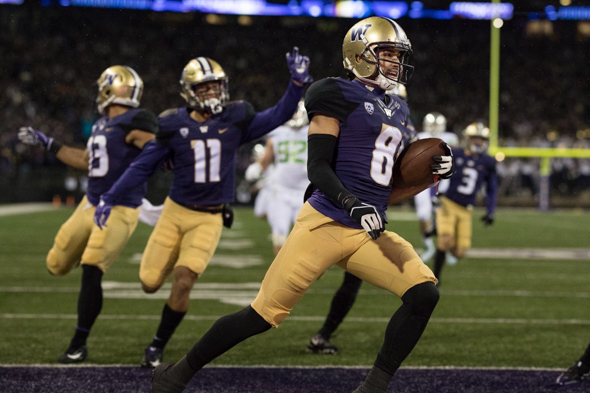 The big winner was senior Dante Pettis of the Huskies, named to the first-team offense as a wide receiver and again as a return specialist. Pettis, a second-team all-conference choice last year, established the NCAA career record for punt return touchdowns with nine, four this season. Also making the first team for UW: junior Kaleb McGary and senior Coleman Shelton, both offensive linemen; junior DL Vita Vea, a junior, and sophomore DB Taylor Rapp. Washington State’s first team selections: OL Cody O’Connell (Sr.) and DL Hercules Mata’afa (Jr.). Six Huskies were name to the All-Pac-12 second team: RB Myles Gaskin (Jr.), TE Will Dissly (Sr.), DL Greg Gaines (Jr.), LB Keishawn Bierra (Sr.), LB Ben Burr-Kirven (Jr.) and DB Jojo McIntosh (Jr.). Three Cougars made second team: OL Cole Madison (Sr.), DB Jalen Thompson (So.) and PK Erik Powell (Sr.). Washington’s honorable mentions were RB Salvon Ahmed (Fr. ), LB Tevis Bartlett (Jr.), QB Jake Browning (Jr.), DB Myles Bryant (So.) and OL Nick Harris (So). Joining Falk on WSU’s honorable mention list: OL Andre Dillard (Jr.), LB Frankie Luvu (Sr.) and RB Jamal Morrow (Sr.). Falk led the Pac-12 with 30 TD passes. He set Pac-12 and WSU career records for passing yards (14,486), passing touchdowns (119), total offense (14,086), plays (2,306), completions (1,404), attempts (2,055) and 300-yard games (30). Also Tuesday, UW’s Vea and WSU’s Mata’afa were selected as finalists for the Polynesian College Football Player of the Year award. It will be announced Dec. 12. QB: Sam Darnold, So., USC. RB: Ronald Jones II, Jr., USC. RB: Bryce Love, Jr., Stanford. WR: N’Keal Harry, So., Arizona State. WR: Dante Pettis, Sr., Washington. TE: Dalton Schultz, Sr., Stanford. OL: Tyrell Crosby, Sr., Oregon. OL: Nate Herbig, So., Stanford. OL: Kaleb McGary, Jr., Washington. OL: Cody O’Connell, Sr., Washington State. OL: Coleman Shelton, Sr., Washington. DL: Rasheem Green, Jr., USC. DL: Hercules Mata’afa, Jr., Washington State. DL: Harrison Phillips, Sr., Stanford. DL: Vita Vea, Jr., Washington. LB: Uchenna Nwosu, Sr., USC. LB: Cameron Smith, Jr., USC. LB: Kenny Young, Sr., UCLA. DB: Isaiah Oliver, Jr., Colorado. DB: Taylor Rapp, So., Washington. DB: Justin Reid, Jr., Stanford. DB: Marvelle Tell, Jr., USC. PK: Matt Gay, Jr., Utah. P: Mitch Wishnowsky, Jr., Utah. RS: Dante Pettis, Sr., Washington. AP/ST: Brenden Schooler, So., Oregon. AP/ST: Michael Pittman, Jr., USC. QB: Josh Rosen, Jr., UCLA. RB: Royce Freeman, Sr., Oregon. RB: Myles Gaskin, Jr., Washington. WR: Deontay Burnett, Jr., USC. WR: Darren Carrington, Sr., Utah. TE: Will Dissly, Sr., Washington. OL: David Bright, Sr., Stanford. OL: Toa Lobenahn, Jr., USC. OL: Cole Madison, Sr., Washington State. OL: Kolton Miller, Jr., UCLA. OL: Salesi Uhatafe, Sr., Utah. DL: Greg Gaines, Jr., Washington. DL; Jalen Jelks, Jr., Oregon. DL: Christian Rector, So., USC. DL: JoJo Wicker, Jr., Arizona State. LB: Keishawn Bierra, Sr., Washington. LB: Ben Burr-Kirven, Jr., Washington. LB: Troy Dye, So., Oregon. DB: Julian Blackmon, So., Utah.DB: Chase Lucas, Fr., Arizona State. DB: JoJo MIntosh, Jr., Washington. DB: Quenton Meeks, Jr., Stanford. DB: Jalen Thompson, So., Washington State;.DB: Jaleel Wadood, Sr., UCLA. PK: Erik Powell, Sr., Washington State. P: Jake Bailey, Jr., Stanford. RS: Boobie Hobbs, Sr., Utah. AP/ST: Matt Lopes, Sr., USC.